Quick Review: While it was good, it didn’t quite live up to the Anthony’s reputation. This location features the same decor and ambiance that has become recognizable i in the ever-increasing numbers of Anthony’s joints around Denver and vicinity. No big surprise or disappointment here. Now for the Za…while still quite tasty, I did find two main faults that knock this particular Anthony’s off the high pedestal. 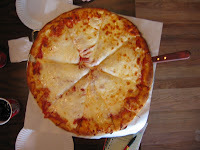 #1 Our 18″ cheese pie was actually only 18″. In many locations you are often rewarded for your choice to dine in with a pie that overlaps the boundaries of the tray by a couple inches all around. With a pie that big, you KNOW you are done at 2 slices, this time i was forced to have a third 😉 , thus, less to take home for later. #2 The pizza was slightly light on the sauce. I LOVE Anthony’s sauce, and I was missing the occasional pockets of deep red, well-herbed, red stuff. #3 I figure this pie was overcooked by about a minute. The crust was a brittle step beyond the perfect balance of crispy and chewy. The cheese had also just begun to develop a hard skin. 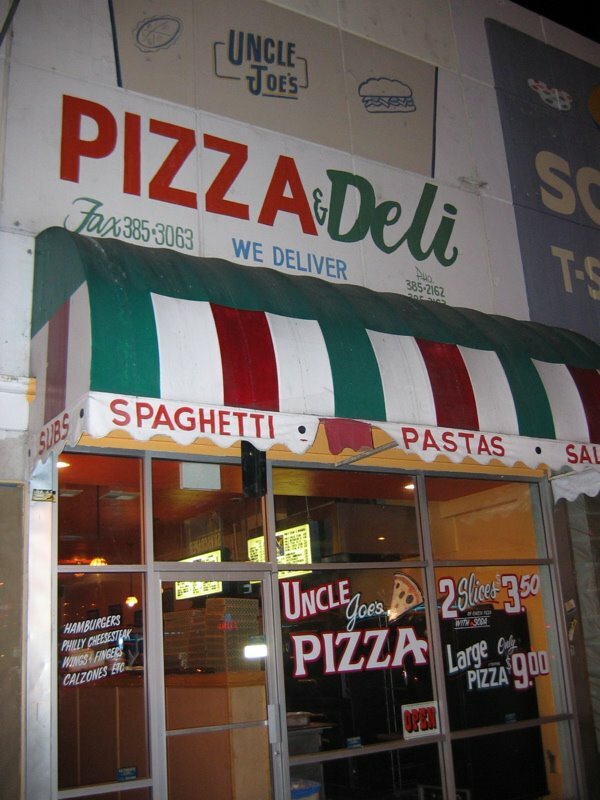 I know this is knit picky, but some of you may recall that my fist exposure to New York style pizza was through Anthony’s. I tend to hold them to a higher standard. I just think the Arvada location has a little work to do. 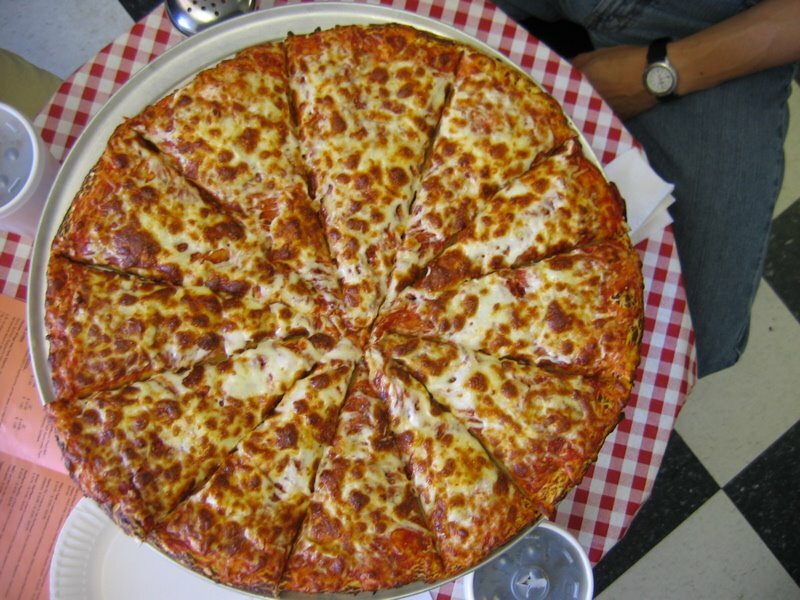 Standout Tidbit: 18″ & 26″ sheet pizzas in addition to 16″ & 12″ round pies. 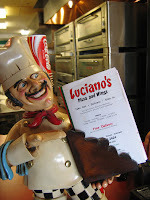 Review: Luciano’s is located on Broadway just 2 blocks south of the Denver Public Library and the Denver Art Museum. The restaurant is clean, and the exposed brick walls are decorated with framed Italian Art Deco posters. Even though there is enough seating for at least 20-30 patrons, our groups have been the only dine-in customers both times I have visited. Judging by the cavernous kitchen and its 4 big pizza ovens, I assume Luciano’s gets a large amount of delivery sales from the Capitol Hill and Golden Triangle neighborhoods, as well as a decent amount of foot traffic from the Broadway club-goers needing late night pie by the slice. There are several specialty crusts on the menu, and we ordered a basic cheese pie with the garlic crust. 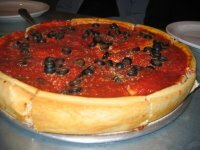 The dough seems to be their standard offering with a special topping added to the outer rim/lip, as opposed to being incorporated inside the crust. It was, in fact, very garlic-y. 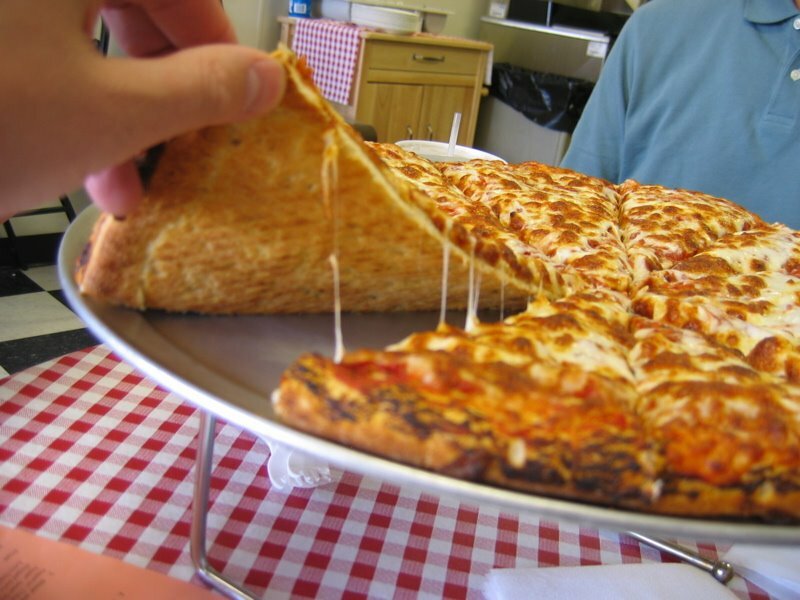 This thin-crust pie has a lot of thickness to it. 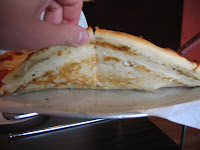 Although the outer layer has a nice, slight crispness, the inner crust is very soft, doughy, and breadlike. The cheese was layered thick on top and looked to be just a smooth layer of glistening white-ness with only a hint of browning. It was so think, in fact, that when it came out of the oven, you may have been hard-pressed to see any sauce peeking through, until the pie is cut into slices. We found it to be quite gooey and stringy when separating a slice from the tray or taking a bite. As far as the flavor of the cheese, it was pleasant and mild without being overly salty or greasy. Once the za cooled down enough to taste everything properly, we agreed that the sauce was our favorite part. (My brother and I RARELY agree on anything.) It was very flavorful and tomato-y without being too sweet or salty. The texture was quite smooth without being creamy. The downside of this pie in my opinion (others have corroborated my impressions), is the sheer quantity of the cheese and sauce and thickness of the crust. Everything is present in equal amounts, but I personally feel there is too much of everything. One quick peek into my vast archives of past pizza pics reminded me that Luciano’s is just as generous with the addition of fresh toppings as they are with the core ingredients. I thought this to be a slightly dangerous pie as once you a bite through the thick strata of cheese and toppings, you then have to worry about the deep reservoirs of scalding red sauce squirting out the sides of your slice or down your chin. I, for one, quickly opted for a knife and fork, as things were getting messy. Tasty, but messy. In all fairness, it has taken me a LONG time to post this review and I should go back to check to sample another pizza and my facts. A Zealot’s work is never done. Of note: Most locations also serve liquor (helps to deal with the kiddie birthday parties in the next room). Tasty Tidbit: You say it’s your birthday? Happy Joe’s believes that all birthdays are special. Let them know and you’ll get a giant ice cream sundae for dessert. Review: My most recent trip to Happy Joe’s was about a month ago and I have been putting off writing this review ever since. Why? Simply because I don’t have enough words in my vocabulary to describe what it feels like to walk through the doors and into pizza heaven. 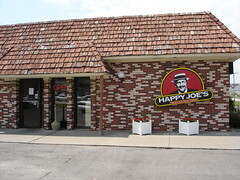 Happy Joe’s Pizza and Ice Cream Parlor is a fairly common midwest chain with over 60 locations in six states (Iowa, Illinois, Minnesota, Missouri, North Dakota and Wisconsin). As a child, Happy Joe’s was the first pizza I ever tasted and it’s thanks to them that I’m such a zealot today. Birthday parties, family events, and ordinary pizza nights were all celebrated with the help of Happy Joe’s. In fact, in the early days of dating my future husband, I took him to Happy Joe’s on his very first visit to Iowa. The jury’s out, but I’m pretty sure the allure of returning twice a year for great pizza was a primary factor when he proposed. Recognizing the fact that we have such a long history together, I thought my Happy Joe’s review might be a little biased. So, I returned with an open mind, a notebook, and a camera to determine once and for all – is it REALLY the best pizza ever? The menu at Happy Joe’s touts your typical pizza fare, but has some lovely surprises as well. 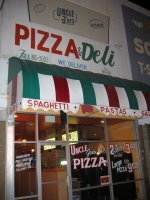 “Traditional” pizza lovers might be taken aback to see such specialty pizzas as Happy Joe Special (ham and sauerkraut), Taco pizza, or a Spaghetti Pizza, but every ‘za here is done deliciously. 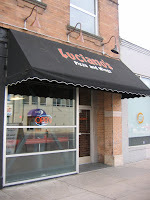 Our most recent visit took us to one of two locations in Cedar Rapids. Being closer to the airport (and our first stop after we arrived in town) it’s not the location we’d typically go to, so I was excited to try my objective review on a new joint. We ordered a large Happy Joe Special, a staple for any of our visits, and a Little Joe with onion, pepperoni and sausage. We got there a little after 1:00, right when the all-you-can-eat pizza lunch buffet was ending, and had our choice of tables. (You read that right – an all-you-can-eat pizza buffet. Did I say this is pizza heaven or what?) Soda is served at a do-it-yourself fountain and refills are free and unlimited, so I filled up on Cherry Coke and waited patiently. The pizzas were delivered in about 20 minutes, and looked (and smelled) as delicious as ever. Real cheese is used and the toppings are always fresh (although some are sure to debate how “fresh” sauerkraut really can be). 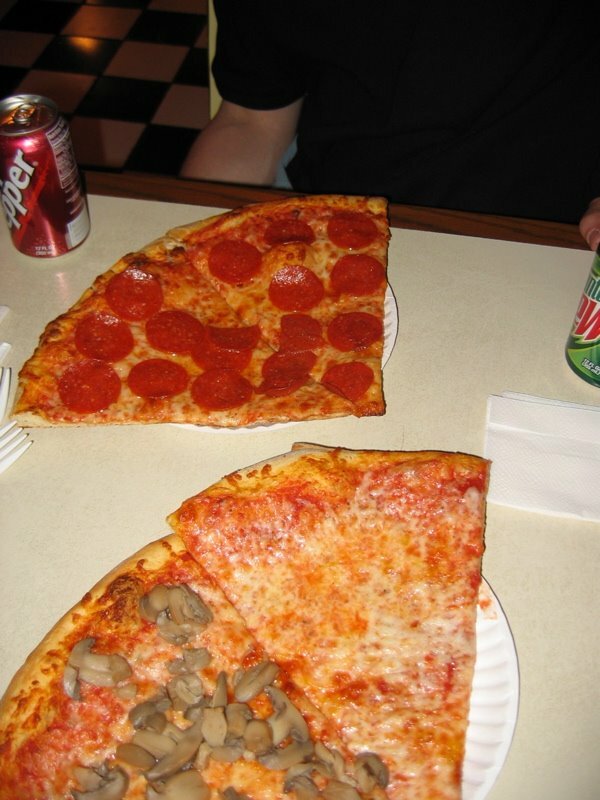 The large, 16″ ‘za was cut into 12 narrow slices – perfect for having “just one more piece” no matter how stuffed you are. The buttery crust was perfect; crispy but not over-cooked. The sauce, cheese, and toppings were all evenly dispersed, not allowing one taste to over-dominate the others. Even my mom, who doesn’t like sauerkraut, took a bite and commented on how tasty it was. I have no complaints when it comes to this pizza, and wish all could be this good. The only drawback to dining in comes when you walk by the ice cream parlor at the end and are too darn full for dessert. Skeptical? Try for yourself. For a $50 delivery charge with a minimum of three large pizzas (it’s cheaper than gas and worth every penny! ), you can have Happy Joe’s delivered right to your door. Review: When Westword – our local, independent newspaper – comes out with their “Best of Denver” every year, the first thing I do is check out their various pizza picks. Since SupaCoo has already covered the pick for “best” NY-style pie for 2006, I took it upon myself to check out Beniamino’s, the “thick crust” title winner for both 2005 and 2006. 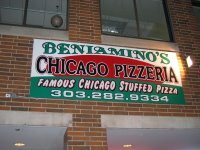 Located at the corner of Broadway and Ellsworth, Beniamino’s is in a great spot for someone who is hitting the vintage “SoBo” shops, hungry after a movie at the Mayan Theater, or stumbling through the middle of the Broadway Bar Crawl. The restaurant is clean and has an open feel, with maybe a dozen small tables sprinkled throughout. The walls display a mix of Chicago paraphernalia, local concert flyers, and modern paintings. 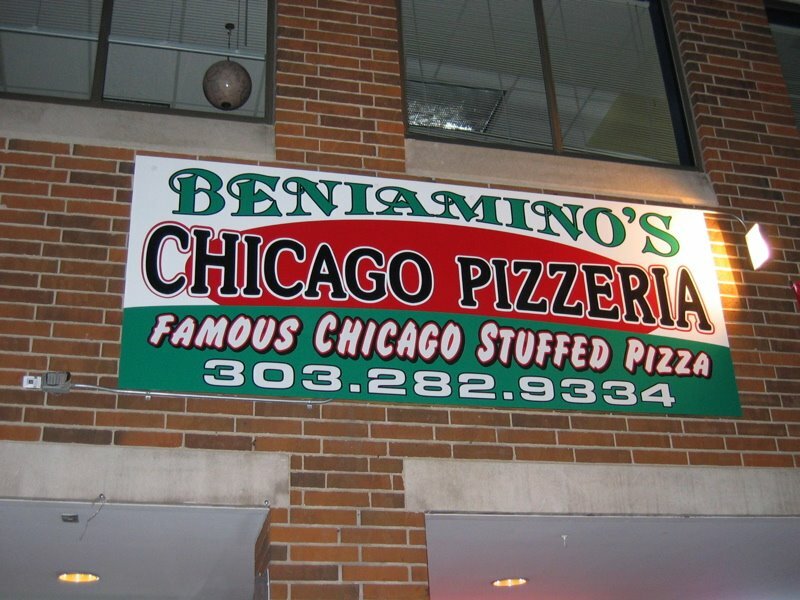 Ben Guest, the head honcho at Beniamino’s, will proudly let you know that he has received a bevy of “Best Thick Crust/Chicago Pizza” accolades since opening a couple of years ago. He really lights up, though, when he breaks out his 50-year-old, well-worn, deep dish pans. He credits the pans with his ability to make a true south-side Chicago pie unlike anyone else in Denver. This visit, we settled on a 14” (large) stuffed crust pie filled with veggies. The pizza arrived after the requisite 30 minute baking time in the traditional oven (no conveyor belts here). The high, golden walls of crust contained a pool of sauce that had been ladled on top of the “upper crust.” The rest of the fresh ingredients (olives, green peppers, tomatoes, and mushrooms) were all safely tucked away between the top and bottom layers of crust (much like in a calzone), where they retained their moisture and mixed with a thick, soft layer of tasty mozzarella. The sauce was slightly seasoned, tasted very fresh and “tomatoey,” and had a hint of sweetness. Ben applies the sauce on top at the beginning of the baking. This prevents the upper crust from baking to the same degree as the rest of the shell. Although I was fine with it, a couple fellow Zealots were put off by the variation in crust texture. For a moment, we were trying to determine if the gooey, unbaked top crust was actually a second layer of cheese. 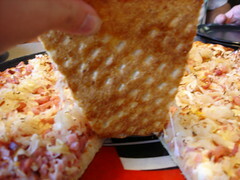 The sides and the bottom crust had a nice, slightly buttered flavor and were firm, evenly browned, and light in texture. The slices of this stuffed crust za are very thick and clearly meant to at least be started with a fork. I had to argue with my full stomach to just let me finish a second piece. This 14” pie (along with some Greek salads and a few bottled microbrews) filled up 4 adults, and there were still a few slices left over for lunch the next day. Most of us agreed that this pie deserved a “pretty good” overall rating. 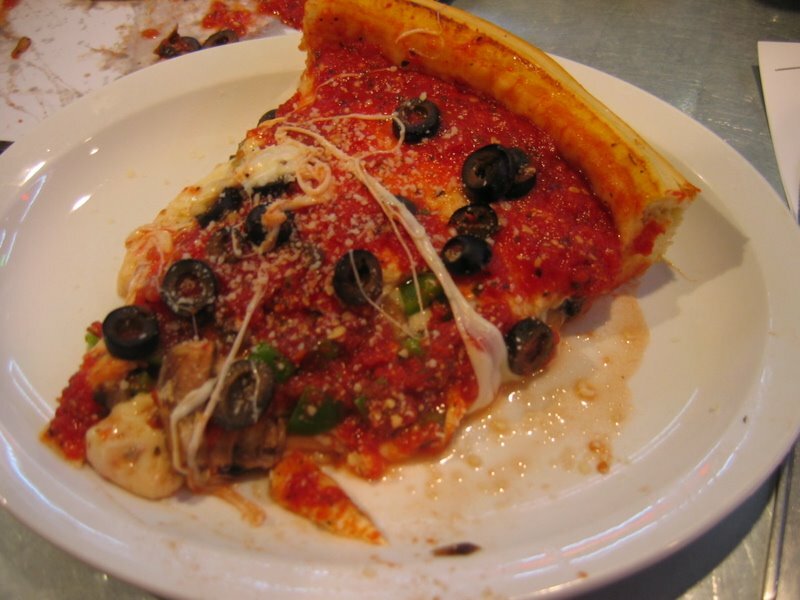 Clearly, it was the best true Chicago-style za we had tried in Denver…at least up to this point. A devout Zealot’s work is never done. just a block and a half past the Freemont Street Experience (between Neonopolis and El Cortez Hotel and Casino). Standout tidbit: Downtown Vegas, baby! Review: Right away we noticed that the special was 2 slices and a canned drink for $3.25. This is a pretty good deal for someone who has just taken a beating at the blackjack tables and forgot to ask for a comped buffet. The four of us sauntered in around 9pm on our way to the double-deck tables at the El Cortez. We placed our orders, selected our canned sodas out of the cooler and waited about 8-10 minutes for our slices to get reheated. I found the atmosphere to be pretty suitable for a joint named Uncle Joe’s. It was narrow with most of the front of the place being taken up with the counter and “kitchen”. The lighting was dimmed and the walls were painted orange, which made the restaurant seem dingy. The only signs of “character” were the black and white checkered floor and a few Tiffany-style-“we’re just like Shakey’s” lights hanging from the ceiling. My impressions of the pizza itself were mixed from start to finish. I ordered a cheese slice and a mushroom slice and they came out nice and super-thin. The plain slice looked tasty with a glossy, even mix of cheese and sauce, but I was a little put off by the obviously canned mushrooms on my second slice. Phat Pocket J-Dogg’s pepperoni slices seemed to have good coverage, but I can’t speak to the taste. Although baked on a screen, the crust had a good texture and was cooked well, but seemed flavorless. The cheese tasted nice, but might be too greasy for some. I am assuming the sauce came out of a can and I felt it relied on salt too much for seasoning. While a couple members in our group thought this was really bad pizza, I didn’t think it was a complete failure. I walked in hungry with a slight beer buzz, and for 3 bucks and some change I walked out full and sober enough to go win $75 in the next 20 minutes at the El Cortez. I don’t recommend making any special trips to Uncle Joe’s, but if you are staying in downtown Vegas, walking around Fremont Street, and drinking either a fruity beverage out of a plastic “yard” with a shoulder strap or a cheap beer out of a clear football, Uncle Joe’s might tide you over if you have that desperate pizza craving. Standout Tidbit: Everything’s better with Strawberry fountain soda. Yum! 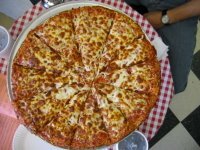 Review: Five days after reading about Pizza Junction winning “Best Pizza of the West“* at the International Pizza Expo, three faithful zealots ventured out for a try. After all, “award winning” and “pizza” are some of our favorite words. Pizza Junction lives in a 70s-style strip mall just north of the Tech Center. The nondescript interior is plastered with train pictures, clocks, signage, and anything that shouts “CHOO CHOO!” (including a clock that, on the hour, does just that). We strolled up to the counter to place our order for the standard large cheese. 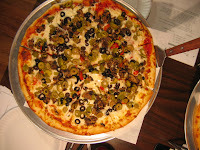 We were thrilled to discover that the Junction is one of the few non-NY style places to offer an 18-inch za. The other surprise – a choice of three self-proclaimed “savory sauces” – Traditional, Spicy, and White. After inquiring about the best, we settled on their recommendation of spicy. When our piping hot pizza was delivered it nearly covered the entire surface area of the small table. The cheese ventured nearly all the way to the edge of the crust and was bubbly and browned (almost too much so for our taste). Digging in (caution: HOT!) we munched through a traditional-style crust and discovered a slightly zesty bite to the sauce. The crust was soft and chewy, with a nice flavor. There was no crispiness to it at all. I thought the spicy sauce was fine, but I would like to return to try the traditional since I prefer a more tomato-y flavor. This had a strong “tangy” character in addition to the slight spicy heat. The cheese had a good, not-too-salty taste, but was about four minutes too brown and seemed to get lost among the odd spicy sauce and pillowy crust. As we finished up our meal, the tiny restaurant started to jam with local high school students. The remaining tables filled up quickly with prepubescent teens and was more than enough incentive for us to refill our sodas and hit the road. 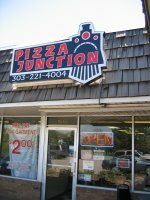 I hope to return to Pizza Junction to give another pizza a try (especially if they add sauerkraut as a topping as I suggested. 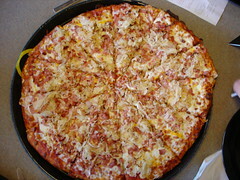 Luckily, along with the colossal 18-incher, they also offer personal size pizzas that I wouldn’t have to share.) In addition, their Cinna-Pie and Caramel Apple Pizzas sound like delicious ways to finish off a meal. 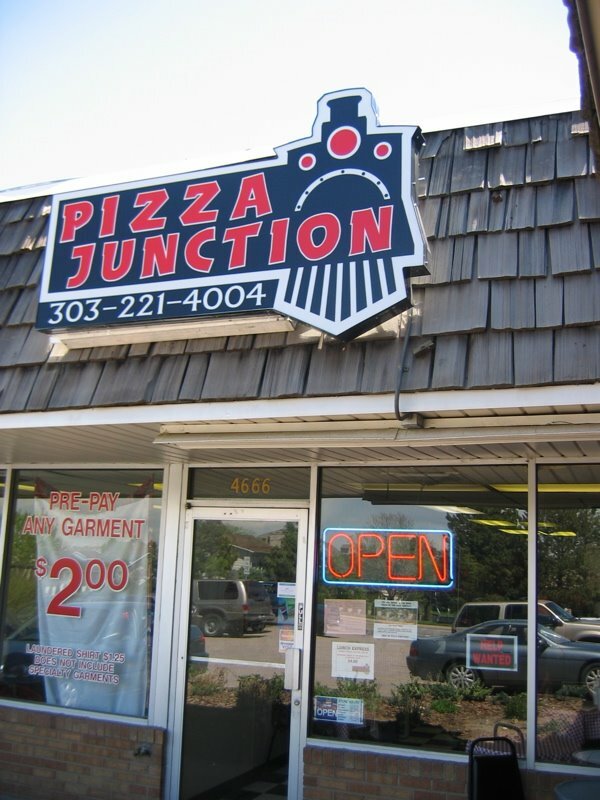 Hit the tracks to the Pizza Junction and let us know what you think! Standout tidbit: Avoid the free cookies as you exit. If you need sweet stuff, go for the straight-outta-Brooklyn Drakes Cakes displayed throughout the joint. 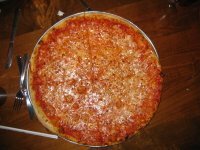 Review: After much great za lately, I was excited to try the proclaimed best NY-style pizza of 2006. 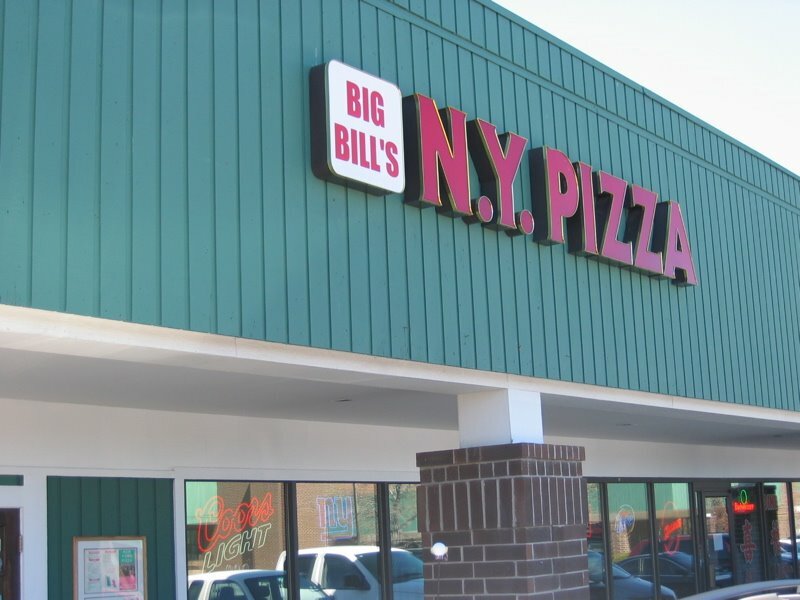 Being the NY-style pizza lover that I am, and finding Big Bill’s to be near my suburban office, I couldn’t wait to try it out. However, I think someone over at Westword must have had the munchies when they picked this one. 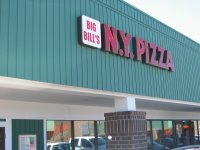 I don’t claim to know where the best NY Style pizza in Denver is, but Big Bill’s CAN NOT be the best. Don’t get me wrong – I’m not saying Big Bill’s is bad, per se. But to be the best – I mean, that’s setting some lofty expectations. We headed over for a lunch-time za about a week after “the best” rating came out. It’s one of those typical suburban strip mall pizza joints, with a blandish interior (think plastic wood tables and chairs stolen from Shakey’s) and random NYC-related sports crap. 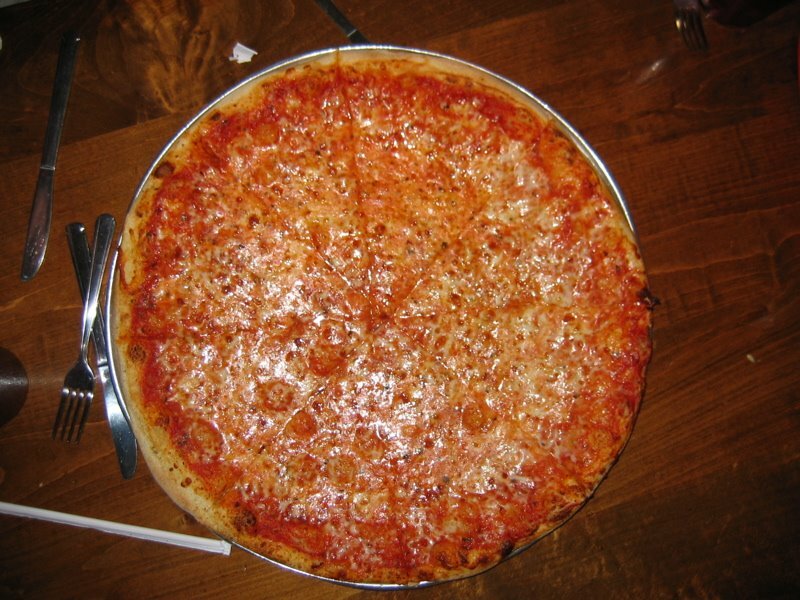 Big Bill’s large pizzas are only 16″, and four of us usually split an 18-incher at Anthony’s. So we warmed up with large salads ($3.25) and tasty garlic knots ($3.99 for a dozen). The knots were good, slightly salty/garlicy and the marinara sauce was delish as well. So far, so good. The menu also offers calzones, and anything that looks or sounds remotely Italian. After a short wait, out came our piping hot fresh cheese za. We dug in eagerly. My first slice had somehow been missed by the sauce fairy as the red stuff was really sparse. 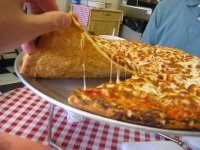 (The second slice was better in that regards, and the sauce was interesting – slightly sweet – once I got some.) The crust was crunchy and cracker-like, which was probably because it had to hold its weight against the rivers of oozing grease. But almost too crunchy, in a disturbing “Am I going to chip my tooth?” way. The amount of cheese was a little on the skimpy side, with a small spattering of oregano sprinkled on and baked in to top it all off. The pizza was a little more on the “well done” side, when I prefer medium doneness (perhaps explaining the crunch?). Overall, the pizza was fine – really more forgettable than memorable. But it was pizza, and all Zealots know that some pizza is better than no pizza at all.